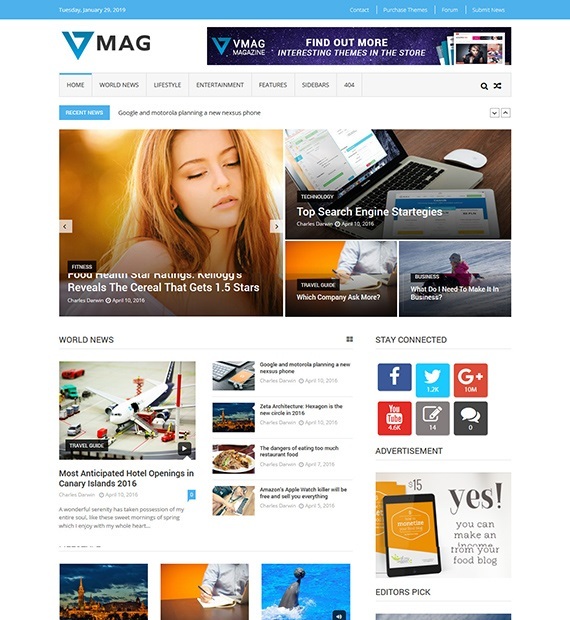 Perfect for magazines, newspapers or professional blogs, VMag is a free and responsive WordPress theme with an elegant and modern look. This theme is definitely not lacking in features with over 13 custom widgets, carousel news widget, custom logo, twitter feed, social icons, and news ticker, just to name a few. This powerful theme is also coded to be secure and SEO friendly. On top of that, VMag is also translation ready, cross-browser compatible as well as advertisement ready. Express your creativeness and inventiveness and create a carousel of your posts with the help of the in-built post carousel option for selective posts as the list view. Use your website using any preferred browser of your choice without any unnecessary lag and even more faster loading time.